Flip-book concept is unique to the marketplace in that knitters will be able to create literally thousands of customized sock designs by simply flipping divided pages. Socks a la Carte is the ultimate resource for sock knitters who want to design their own original patterns without starting completely from scratch. General instructions at the beginning of the book outline the basics of sock construction, including measuring feet and making calculations based on gauge. The unique flip section is where the pages are divided into three categories: cuff, leg and sock body, which includes the heel and toe. 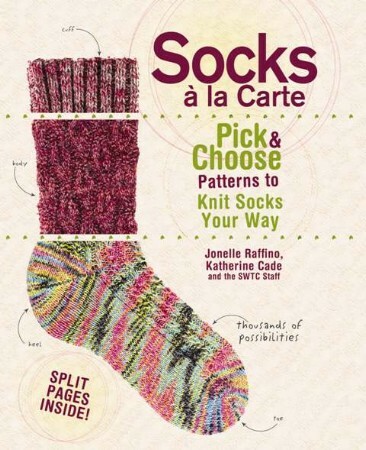 Readers can flip these pages to see how the individual elements work together and then mix and match these patterns to create unique sock styles that they can then knit according to their personal preferences. A bonus gallery will feature a number of finished sock styles in a variety of colors as inspiration for the reader. Jonelle Raffino is a lifelong knitter and the creative force behind Southwest Trading Company (SWTC), an internationally recognized yarn brand known for its earth-friendly collections. She has been featured in a variety of media venues, such as Inc, Fortune and Success. She has also written numerous articles about SWTC, earth-friendly fibers and knitting for both consumer and trade magazines.